THE NEW Range Rover Evoque is the hipster of luxury compact SUVs. The British maker has developed a social conscience and its new Evoque has a host of eco-friendly options that will make it even more at home among the inner-city enclaves it currently inhabits. Diesel engines will be available with 48-volt mild hybrid (MHEV) technology that stores energy lost during braking and allows the engine to be switched off at speeds under 17km/h and during braking to reduce emissions. The mild-hybrid technology is also available on the most powerful petrol engine. Land Rover will also launch the first plug-in hybrid Evoque with the next 12 months, combining a three-cylinder engine with a battery pack. Land Rover's hybrid technology integration manager, Dave Skipper, says that the maker is making a concerted effort to lower emissions and that this is just the first step of many. "Electrification is central to future mobility solutions and mild hybrids are the first step on this path," says Skipper. "An MHEV need never be charged and delivers real-world fuel consumption reductions that benefit almost all Evoque buyers. And for those customers that want silent Range Rover refinement, a plug-in hybrid model will be due within 12 months," he says. The maker continues its eco-friendly focus inside with the use of a range of recycled materials. Instead of leather buyers can choose materials made of recycled plastics blended with wool and one made out of Eucalyptus. Land Rover claims that the Kvadrat wool blend option uses the equivalent of 53 500ml plastic bottles throughout the car. 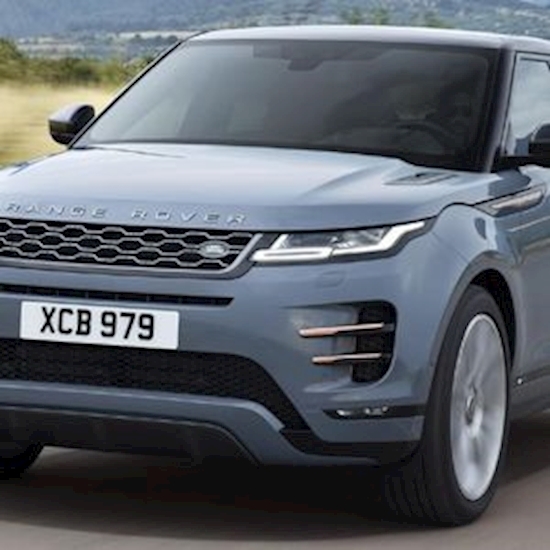 "The use of recycled and natural materials in the Evoque along with the addition of the hybrid powertrains not only enhances its appeal but also underpins our approach to sustainable luxury," says Chris Thorpe Land Rover head of sustainable business. The Evoque is built on an all-new platform that allows for the hybridisation of the range but it is still compatible with four diesel engines and three petrol units in differing tunes. "The architecture is all-new to accommodate both plug-in and mild hybrid systems, with only the door hinges remaining unchanged on the body. The new chassis makes the most of the stiffer body, ensuring the characteristic ride comfort and refinement of a Range Rover," says Jaguar Land Rover chief product engineering Nick Rodgers. Range Rover still wants the Evoque to be off-road ready and has equipped the all-wheel drive high-rider with its Terrain response technology that reads the ground in front of the vehicle and adjusts the suspension set-up accordingly. The Evoque can now wade to depths of 600mm up from 500mm. The Evoque has also been packed with new technology headlined by the world-first Ground View feature. The technology works by displaying what is below the bonnet onto one of the vehicle's two 10-inch touchscreens. Ground View allows drivers to navigate tough terrain, tight car spaces or high curbs. In-car tech has been beefed up with Apple CarPlay and Android Auto and the ability for over the air updates to the infotainment technology. The new Evoque is slated to be priced from $64,640 (before on-road costs) when it goes on sale in Australia from the second quarter of 2019. Full Australian details about the Australian range will be revealed closer to the vehicle's local launch date.